Growers across the Cotton Belt are the backbone of the cotton industry in the United States. Each month Cotton Incorporated will showcase an interview with a cotton grower highlighting his or her production practices and any unique programs they are involved with in the raising of cotton on a new section of their Web site called “Spotlight on Beltwide Growers”. The interview of each grower will be available for reading on the Web site for one month. After that time, an interview with another grower will be posted. The interviews of the previous grower(s) will be archived in the Web site so they can be re-read at any time. The first spotlight features an interview with Cannon Michael of Bowles Farms in Dos Palos, California. In it, Cannon shares how Bowles Farms is using satellite imagery technology to manage variable and saline soil. 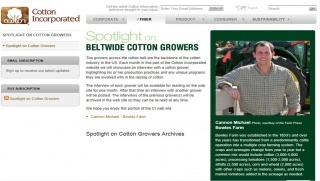 To read the full interview with Michael, visit the “Fiber” section of www.cottoninc.com and click on the “Spotlight on Beltwide Growers” link. National CineMedia (NCM), a leading integrated media company reaching U.S. consumers in movie theaters, online and through mobile technology, recently showed support for Cotton Incorporated’s Blue Jeans Go Green™ denim recycling program. 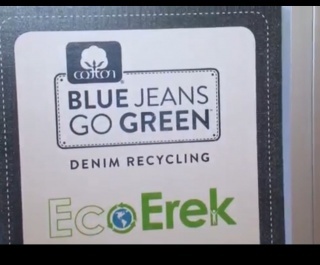 NCMs showed a 75 second piece highlighting the successful denim recycling efforts of Erek Hansen, also known as Eco-Erek. This remarkable fourteen-year-old from Toledo, Ohio, has been contributing to the program since 2009 and has collected more than 20,000 pieces of denim for recycling. The video ran in AMC, Cinemark and Regal theaters across the U.S. June 27th through July 24th. To view the video please visit www.cottonboard.org/news/video-gallery/. Both New York futures and the A Index trended sharply lower in recent weeks. Chinese and Indian prices were stable. Pakistani prices decreased. Over the past few weeks, December prices fell about ten cents/lb and marked new life-of-contract lows. Nearby prices are the lowest since June 2012. The A Index prices also decreased. This time of year, when the crop year changes and new supplies will soon come onto the market, Cotlook implements a dual price system that quotes prices for both the expiring and upcoming crop years. Currently, the conventional A Index describes prices for near-term delivery of 2013/14 supplies (shipment in July or August). This price series decreased five cents/lb in recent weeks and has been holding to values near 85 cents/lb. The “Forward A Index” describes prices for delivery in the coming crop year (shipment October-February). In the past few weeks, the Forward A Index lost eight cents/lb and has been trading below 78 cents/lb. In recent years, price movement could be explained through several principal factors. The most significant of these would be Chinese cotton policies that concentrated global supplies in China. This concentration was a function not only of China’s accumulation of reserves, but also of stronger Chinese demand for fiber and yarn imports that prevented stocks from accumulating elsewhere. Lower stocks outside China, which are generally considered available to the market, supported prices despite record volumes at the global level. Another factor that supported prices was the weather, with West Texas, the largest growing region in the U.S., suffering three successive years of extreme drought. It appears that these supportive factors will diminish in the coming crop year. West Texas has received above average rainfall this calendar year, and China has indicated it will no longer support growers through purchases by its reserve system. Chinese imports of fiber are expected to fall 40% and Chinese yarn import demand began to decrease last fall. Due to these factors, stocks outside of China are forecast to reach a new record in 2014/15 and the expected increase in available supply has already pushed prices lower. Developments involving growing conditions around the world and Chinese policy should determine whether recent decreases will be sustained or augmented.